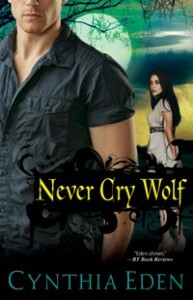 Release Week Day 4 (Part 1) – win Cynthia Eden’s NEVER CRY WOLF! I love that Cynthia set this book on the West Coast. (Especially since I’m a left coast girl.) To win a copy of this book, tell me one city on the West Coast you’d like to visit (or a city out here you’ve been to and would love to re-visit). I want to revisit LA. I have been once for all of 48 hours…not enough time! San Francisco and Napa Valley! I want my husband to experience all the joys there. I have been a few times but it has been over 10 years! Well I’ve lived in LA for over a year now and before that I’d visited several places in California. But 1 place I’ve always wanted to visit on the West Coast is Seattle. I need to make my way North sometime. I’ve been to Portland and LOVE it. Have told hubs I’d move there in a heartbeat :). I love Cynthia’s books. Thanks for the giveaway. i would love go back to San Diego. it was a fun time. but it was a long time ago. I would love to visit Los Angeles, my dad went there for a business trip once but had a few days to look around and he loved it there. I hope to make plans to go soon. I’ve heard so many great things about Vancouver. Maybe one of these days I’ll get to go there. Does Vancouver count? It’s in Canada but it’s still a West Coast city. I would like to see to Napa Valley and San Diego. I love San Francisco and would love to go there again. I also want to visit Catalina Island. I would love to visit the Napa Valley. I would love to explore the Wine Country in Napa. Would be especially fun with a group of my girl friends. San Francisco is one of my favorites cities. There are so many things to do and see as well as great shops and restaurants to visit. It’s been quite a while since I have been back to this great city. I love to bring my kids back for a visit someday. San Diego. I have heard such great things about it that I would love to go there and visit. Been to the west coast but havent made it there yet. I would love to visit Seattle. I love rain! My husband would pick California though. I’ve always wanted to see San Francisco. I would love to go back to Alaska! I don’t have a specific city but I would love to see the Northern Lights. I’ve been to San Francisco, but I’d love to visit San Diego. I would love to visit Napa Valley. I would LOVE to visit LA! Since I’m from California, now living in Florida, I’d love to visit my sister in Corona, and my friends in Garden Grove. But one of my favorite places to visit is Monterey and I’d love to visit there once again. I loved to visit Seattle. Thanks for the giveaway! I would love to visit Seattle and San Diego. Just recently have gotten into wine so would love to visit Napa valley and tour the wineries. I love rainy weather (a by-product of living in dry southwestern GA), so I would like to visit pretty much anywhere in Washington State or Oregon or Northern California. It’s so pretty and green there, with all the dense forests. Very wolfy territory, now that I think on it. Also, I’ve lived near the Atlantic and Gulf of Mexico my whole life. I’d like to see the Pacific Ocean. oh Oregon coast. I have a couple friends who live out that way and i’ve seen pictures and i’d love to check it out in person. I’d love to visit San Francisco. A friend is getting married there later this year so hopefully I will have the chance. Would probably pick San Diego just for the zoo.